I have self-satisfaction coming out of my ears. 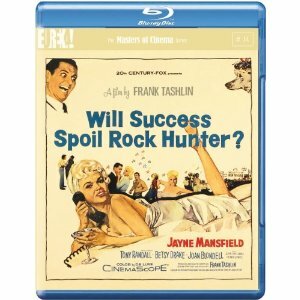 Yes, as I peruse my brand-new, still-warm edition of the Masters of Cinema BluRay of WILL SUCCESS SPOIL ROCK HUNTER?, an emotion akin to third-degree smugness creeps from the dank recesses of my id and leaves complacent footsteps all over my ego and superego. The reason being the three — count ’em! — three “essays” crammed into the compact accompanying booklet, each of them authored — personally — by my brain and forelimbs. That’s not the primary reason to buy the thing, though — you should buy it for the movie itself, a crackerjack box of visual gags, satirical sideswipes and exuberant, nimble comic performances (Randall! Mansfield! Blondell!) and Gorgeous Life-like Color by Deluxe! After watching the thing, my eyeballs feel like they should be sealed in a lead-lined box for a thousand years before it’s safe for them to look at anyone again. That thing has the platonic ideal of all your basic colours, with the brightness turned up to eleventeen. You also get a video intro by arch-Tashlinite Joe Dante, the trailer, a Mansfield newsreel, and an alternative audio track, and a text interview with legend Tony Randall, conducted by Ethan DeSeife. Just watched my copy, and Fiona and I were oohing and aahing at the colours like early cinemagoers experiencing projected images for the first time. An observation from Fiona I wish I’d been able to include in my essay: when Betsy Drake goes Mansfield-mad and starts making that high-pictched EEEOOH! noise associate with J.M., it’s as disturbing as Mercedes McCambridge’s revoicing of Linda Blair in THE EXORCIST. Tashlin’s comedy hovers near the boundaries of nightmare. Consider this a sequel, of sorts, to that long-ago post, Ten Bad Dates With Roddy McDowell. This time, it’s John Carradine who doesn’t seem set to enjoy much luck. The movie is FEMALE JUNGLE, a profoundly silly title for a not quite so silly movie, essentially a retread of BLACK ANGEL. Here it’s homicide cop Lawrence Tierney who fears he may have committed murder during an alcoholic blackout, which is pretty much the most serious faux pas a homicide cop can make. 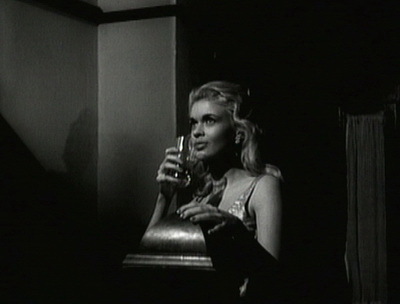 Apart from the always-intense Tierney (a guy who really did go nuts with a drink inside him) and Carradine (who looks GOOD in those specs, damnit — they add another, previously missing dimension to his head), there’s “And Introducing” Jayne Mansfield, who actually acts in a convincing human manner here, rather than deploying the light-comedy fembot style she made so much her own later. 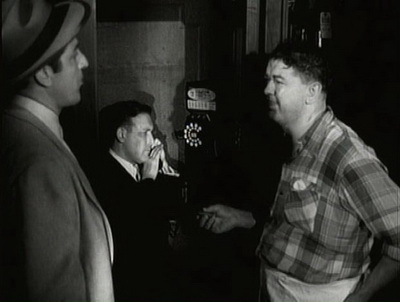 Seen in the clip with Carradine is former beauty queen Kathleen Crowley, who’s quite moving and vulnerable in a Patricia Medina kind of way — her argument scenes with her husband, (screenwriter star Burt Kaiser) are so circular and illogical and poorly-written as to be actually a pretty convincing evocation of the average domestic tiff between people who have just plain gotten into the habit of fighting. Nice atmos of late-night grime. The Amazon product description is a febrile triumph in itself, and worth quoting in full. Do I detect the hand of Master of Cinema mastermind Craig Keller? Remember, if you buy it via my Amazon link, it costs you nothing extra, but I get a little tiny percentage of the proceeds. I will now be offline until, perhaps, Friday night, since I’m going to be in Dublin meeting with producers. A new edition of The Forgotten will appear at the Daily Notebook sometime today, so please drop by and check it out. I’ll link to it when I get back.